Villa Tsaki is located on a hill 80 ms above sea level, overlooking the Ionian Sea and Mainland Greece. The house has been built in the typical Greek style and offers all the comfort one may require. There are 9 different terraces around the house where one can have breakfast, lunch or dinner and enjoy the swimming pool. The sitting room is very comfortably furnished, has satellite smart TV. The kitchen is fully equipped with a 6 hob stove, 2 ovens, large fridge/freezer, dishwasher and microwave. There are 3 bedrooms, 2 on the 1st floor, 1 with a double bed and 1 with 2 twin beds, air-condition and 1 shower room with toilet. The ground floor bedroom has a king size bed which can be separated into 2 single beds, air-condition and en-suite shower room with toilet. A 3rd shower room with toilet is also located on the ground floor. The pool is 11m. x 4.5 m. and is 1.45 m. deep over the whole length with an outdoor shower next to it. At the house is a large private parking place. Beautiful hillside location, stunning villa! The directions to the villa from the airport were very clear, and communication from the owner was very helpful. The book in the villa with recommendations was very useful and we went to some fabulous restaurants in the surrounding area. We loved our holiday at Villa Tsaki and will miss setting the alarm to watch the sunrise from our bed! The pool is amazing! The views are spectacular. 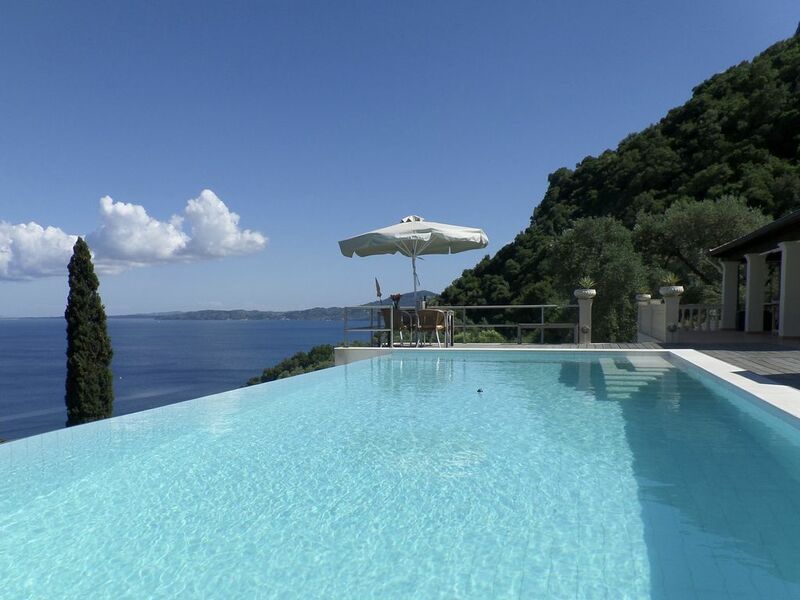 If we return to beautiful Corfu we would love to be able to stay here again. This place was simply outstanding. The view from the back of the house is breathtaking and real life is far better than the photos. There are multiple terraces and seating/sunning areas, with 6 lounge chairs, and plenty of covered spaces or umbrellas for all. There is also an outdoor audio CD player with excellent speakers. The outside was just perfect and as much as we enjoyed touring around Corfu, we looked forward to spending as much time as possible lounging by the pool and absorbing that splendid view....which is captivating in the morning, afternoon and evening (don't miss the moonlight reflecting off the ocean). There are a couple shy pet cats that roam the outside property. They stay away but will warm to your attention if you wish. The house is very spacious and all furnishings and kitchen appliances are first rate. There kitchen is extremely well stocked with plenty of dishes, glasses, cutlery and pots and pans. It's worth noting the pans are in excellent condition as many vacation rentals have non-stick pans that have been abused and ignored, but not here. There's even an immaculately clean propane barbecue grill that the maid will clean after each use! All bedrooms have plenty of storage and closet space, and there's lots of counter space in the bathrooms as well. It can get hot in the summer, but with all the screened doors, there is almost always a pleasant breeze, and all bedrooms are air conditioned if needed. Every interior space is spotlessly clean. The floors are mopped daily so there is never any dust, and even the outside patio areas are swept. The daily maid service is unobtrusive and Ireni's English is excellent so she can answer any question about the property and surrounding area. The host/owner (Willem) is so pleasant to interact with and has really tried to think of everything to make your stay pleasant and easy. The house is very private. It's at the end of a narrow, windy and private lane. There is no car or pedestrian traffic that drives by whatsoever, so you really have total peace and privacy. Finally, there is a very helpful guest book that includes many excellent restaurants both nearby (5-10 minutes away) and a bit further as well (20-30 minutes away), so there are many options for a great meal just a short distance away. I could go on and on, but in short, this place was simply outstanding in every way. Thank you so much for your very kind words. I am so happy to hear that you had a great time. I would also like to thank you for having taken such good care otf the house, I wich all guests where like you and your family. I hope to be able to welcome you sometime in the near future. Well, there are truly no words to describe how magnificent this place is. We are a family of four including my daughters who are aged 13 and 14. Before we arrived they questioned whether the villa would be as good as it looks and sounds on the website. I can honestly say it was so much better. The view from the villa is simply breathtaking. The villa and surrounding areas are spectacular. Willem was there to greet us when we arrived and was just wonderful. The maid Irini was very helpful. We have have the most relaxing holiday. Corfu has definitely treated us well. Thank you Willem. Aqsa and family. We stayed at Villa TSAKI for 10 days 16-26th July 2016. You definitely need a car to get to this wonderful place. ! How the devil did Willem build this ? Unbelievable logistical feat this one ! We arrived with the owner Willem there to greet us. He showed us around the amazingly well kitted out villa. The views are simply brilliant and with the aid of some telescopic equipment provided by Willem you can spend a lot of time checking out the water traffic and moon at night! The sun goes down past the mountain behind the Villa at 6pm so no evening sunbathing. We love the evening sun and so we went over to the far side of the bay near Petriti/ Boukari for the evening sun, swimming and brilliant fish tavernas. Kastridis, the pick of the bunch over there. All in all a fabulous holiday. Thank you Willem for letting us stay in your beautiful home.... You really have thought of everything!! Stephen Sophie Rosie and Freddie. JT and MO. We just returned home after a beautiful stay at Villa Tsaki. Willem was a wonderful host. His beautiful home was well equipped and Willem was kind enough to add some essential groceries to the refrigerator so we didn't have to rush to the market on our arrival. We are a family of six and the space was simply outstanding. Waking up every morning with the most amazing views of the sea just takes your breath away. The villa is just outside of the fishing village of Benetsis where there are many delicious tavernas and lots of beaches nearby if you can drag yourself away from the villa (which is no easy task). Corfu Town is about 15 minutes drive from the villa and is filled with great restaurants and shops. Lots to do in Corfu Town from the Old Fort to the New Fort, the parks and waterfront. Just wander the streets you will not be disappointed. We chartered a boat from Nautalis daily boat cruises and had the most marvelous time with Captain Lakis! We shared the boat with a group of women from the UK and just had a spectacular time! Lakis prepared a grilled lunch with fresh fish, shrimp and chicken. Just delicious! To be able to go back again! Thank you Willem for being such a gracious host! We arrived to this Benitses villa late at night. The friendly owner, Wim, showed us the way from the village and the first impression in the dark was how high we drove. The villa inside was clean, spacious, tastefully decorated and cosy. There were a nice supper ready for us at the villa. Next morning when we woke up and actually saw the view, we were stunned. It was so fabulous as the villa is situated so high and the sea view is so wide. The beautiful, lively mountain forest is near and green fragrance of the forest is present all the time. You can see and hear the numerous birds nearby. For example there were hummingbirds in the garden which is quite exotic for us who live in the Northern Europe. We enjoyed all the terraces around the house. The garden and the spacious pool were well taken care of. There were beautiful flowers, some nice small statues and decoration in the garden which made the surroundings very pleasant. The maid visited the villa every day. She was very helpful and friendly. We had a hired car and drove to Corfu town and to Issos beach. But as the villa is so gorgeous we spent most of the time there. We had dinner twice in Benitses in La Pergola restaurant whose owner was a nice chatty gentleman and the food was delicious but not too expensive. We also visited the Benitses beach which was nice and peaceful. My son had a birthday during our holiday and the owner had arranged some very nice surprises to my son for his birthday. Our family of five spent a very relaxing week in Corfu. The weather was perfect. The sun was shining and the temperature was about 25-30 degrees all the time. As the villa is so high in the mountain there was usually a gentle warm breeze around also in the hottest hours. I would definitely recommend this property to everybody. If you are looking for a peaceful relaxation in the silence, a bit of a luxury and gorgeous views, this is the place. You won't be disappointed. Ask the Owner for more details.